A must have child safety product for any parent or guardian! 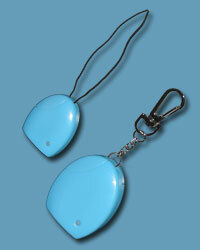 Attach the small transmitter to your child or pet and keep the keyring-style receiver on you. The receiver will sound an alert and vibrate if they wander outside your preset safety zone. You can set a suitable alarm-triggering distance from 0 to 50 feet. A little closer in the mall or store and a little further away in the park or campground. The child protection alarm is always on guard, even if you get distracted for a moment.